The most significant heavyweight event in the U.S. in more than 15 years will feature an undercard lineup of stellar fighters including the return of a unified world champion and two of boxing's hardest-hitting heavyweights. 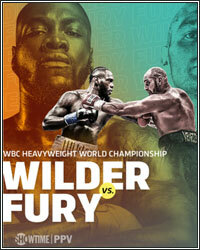 "This fan-friendly undercard features two participants from 2018 Fight of the Year candidates, Jarrett Hurd and Luis Ortiz, along with one of the hottest rising talents in the heavyweight division," said Stephen Espinoza, President, Sports and Event Programming, Showtime Networks Inc. "Heavyweight boxing has re-captured the world's attention and both of these potentially explosive fights will help shape the future of the division. Jarrett Hurd emerged as one of boxing's most exciting fighters in unifying the super welterweight division in 2018. Now, he returns from a significant injury to risk his titles in his quest to become undisputed 154-pound world champion." Hurd, who hails from Accokeek, Md., floored Erislandy Lara in the final minute of their unification showdown to earn the narrow split-decision victory over the divisions' longest-reigning champion. Following the bout, Hurd underwent surgery and subsequent rehab to repair a rotator cuff. Hurd won the IBF title with a TKO of Tony Harrison in 2017 and handed Austin Trout his first loss via knockout later that year. The 28-year-old is known for his all-action, fan-pleasing style that had seen him record seven straight stoppages prior to his decision win over Lara. "'Swift' is back and Christmas is coming early," said Hurd. "This is the perfect way to get ready for 2019. I expect it to be a big year with big fights that the fans will love. I'm locked in right now and ready to put on a great performance against Jason Welborn. Tune in on December 1, because I promise you it won't go 12 rounds." "Jarrett Hurd is a big talent who holds all the belts and I respect the challenge he poses," said Welborn. "I was a huge underdog against Tommy Langford in May and I came through and shocked Britain. In December, I'm going to shock the world. I've been in training camp since my last fight and I've already been preparing for Hurd's style. This is my time." The 39-year-old Ortiz returns to STAPLES Center for his second consecutive fight in Los Angeles after scoring a second-round knockout of Razvan Cojanu in July. In a March, Ortiz nearly had Wilder out on his feet in the seventh until he ultimately succumbed to Wilder's power in the 10th round, suffering the first loss of his professional career. A consensus top-5 heavyweight, Ortiz will look for another knockout as he hopes to earn a rematch with Wilder in the revived heavyweight division. "I'm looking forward to stepping up and challenging myself in an exciting fight," said Kauffman. "Luis Ortiz is the second best heavyweight in the world next to Deontay Wilder. But I'm the toughest fighter you'll ever face. This is my chance to prove that I'm a great fighter and I'm excited to do it on this huge stage." "It's an honor to be part of this huge event and I give a lot of credit to Joe Hanks for stepping up and taking this fight," said Joyce. "Hanks has a good record, but I am coming to take him out. If everything goes to plan and I come through this fight as I should, I am ready for a big fight early next year to show that I'm a force in this division." "It feels good to be in the mix and getting exposure with the top heavyweights," said Hanks. "I bring speed, athleticism and power to this fight. I've got a lot of great experience in my career sparring against guys like Deontay Wilder and Wladimir Klitschko, so I'm comfortable against a guy like Joe Joyce. I live in Los Angeles now and this is going to be like fighting in my front yard. I'm going to be feeling good on fight night."